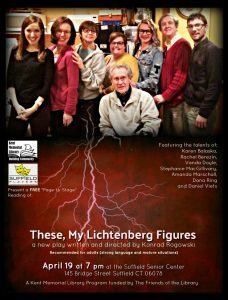 The Suffield Players and Kent Memorial Library team up once again to present a FREE “Page-to-Stage” Reading of a new play: These, My Lichtenberg Figures, written and directed by Konrad Rogowski. This mysterious, dark drama features the talents of Rachel Berezin, Vanda Pollard, Karen Balaska, Stephanie MacGillivary, Amanda Marschall, Dana Ring and Daniel Viets. The show will be performed as a staged reading, and is recommended for adults based on strong language and mature situations. Date: April 19 at 7 pm. Location: The Suffield Senior Center, 145 Bridge Street, Suffield CT 06078. This “Page-to-Stage” Reading is a Kent Memorial Library program, funded by The Friends of The Library.